Watch Box Organizer Pillow Case - 20 Slot Luxury Premium Display Cases With Framed Glass Lid Elegant Contrast Stitching Sturdy & Secure Lock for Men and Women Watch & Jewelry Large Holder Boxes Gift | What Should I Say? When you own more than one watch, you're a collector. Every respectable watch collector knows that an elegant watch box is an great way to store and protect your timepieces, while adding a beautiful decorative accent to your home decor. Cas De Lux’s Watch Boxes are the perfect combination of functionality and style! Your watch box will usually be on display and we have taken that into account, which is why we have designed our watch boxes with only the finest quality of premium PU leather with contrast stitching for a classic appearance in a neutral black color that won’t clash with your home decor. The clear plexiglass top allows you to easily see your watches, which can serve as a decorative accent to your vanity or dresser. It features 20 pillow slots that will cushion your watches securely on individual pillows and make sure they hold their shape. The cushions prevent your watch from wearing and the depth of the slots ensure that your watch faces won’t get scratched on the surface of the box. Don’t worry about your watches wobbling around in their individual sections. The pillows fit snugly so your watches will balance perfectly in their individual compartments no matter what. Our watch box features a lock that is super easy to maneuver and will keep your watches safe & secure. This deluxe watch box is super easy to maintain. To clean simply wipe down with a moistened paper towel and follow up with a dry microfiber cloth and that is all it takes to keep this case clean and plexiglass window streak free. 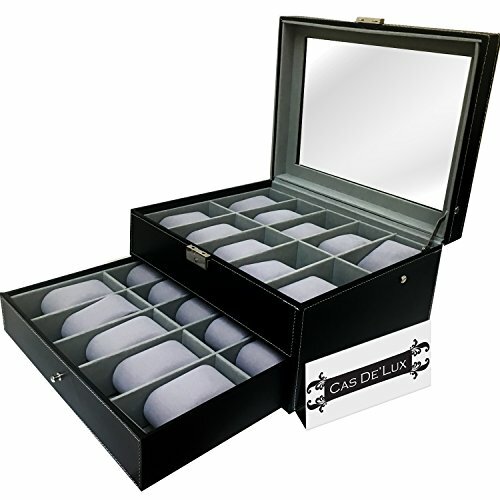 PROTECT YOUR INVESTMENT WITH CAS DE LUX’S CLASSIC & ELEGANT WATCH BOXES TODAY! CLASSIC DESIGN: This elegant and beautiful watch organizer is constructed of premium PU leather and with elegant contrast stitching for a classic and attractive appearance that makes a great decorative accent. DRAW COMPARTMENTS: Whether you're an avid collector or just starting your collection this watch cases for men and women features decorative pillows lined compartments with drawers that preserve the life of your watches and make them easy to find. FRAMED PLEXIGLASS LID: Why not show off your watches to family and friends, with this watch display case that features a framed glass lid to display your beautiful collection and doubles as an artistic statement piece. STURDY & SECURE LOCK: Keep prying hands away from your prized possessions. Our womens and mens watch case features a sturdy lock that keeps your watches safe & keeps them from falling out and shattering if the box falls. MAKES A GREAT GIFT: Know an avid watch collector or someone who is just starting? Gift them with this beautiful watch box for men and women that is neutral, complements any decor and will preserve the life of their watches. Our womens and mens organizer is great as mens jewelry box, watch box organizer for men, stainless steel jewelry for women, women's glass jewelry box and more. If you have any questions about this product by Cas De' Lux, contact us by completing and submitting the form below. If you are looking for a specif part number, please include it with your message.